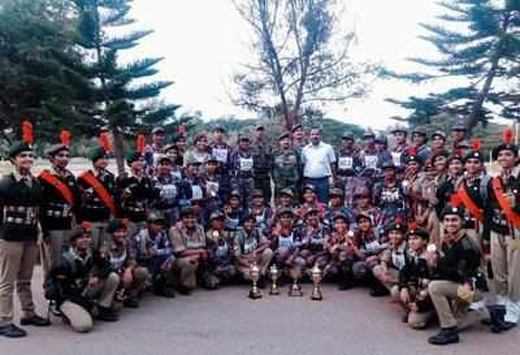 Mangaluru, Oct 25 2018: National Cadet Corps (NCC), Karnataka and Goa Directorate, won the All India Nau Sainik Camp-2018 Championship held in Karwar. A team of ten boys and four girls from Dakshina Kannada, Udupi, Shivamogga and Kodagu districts, represented Mangaluru region and there was a team of four boys and two girls from Goa as well. The cadets excelled in professional competitions like ship modelling, boat pulling, semaphore and firing. NCC Mangaluru Group Commander Col Anil Nautiyal told media at NCC Mangaluru Headquarters in Pandeshwar that the girls’ team of NCC Directorate (Karnataka and Goa) created a history of sorts by securing the second position in All India Thal Sainik Competition. As many as 17 directorates from across the country participated in this competition, he added. Tamil Nadu, Pondicherry and Andaman Nicobar Directorate won the second position while Punjab, Haryana, Himachal Pradesh and Chandigarh Directorate was placed third in the championship which ended on Monday. As many as 680 cadets from 17 NCC directorates took part in the competition. A total of 40 girl cadets and 40 boy cadets, representing Karnataka and Goa Directorate at Delhi for All India Thal Sainik Competition, participated in different competitions including Firing, Obstacle Training, Map Reading, Health and Hygiene, Judging Distance, Field Signal and Tent Pitching. Among the girl cadets, Rakshitha M B from 18 Kar Bn, Mangaluru, won the gold medal for Obstacle Training and Radhika Bhat K from 4 Kar Engr Coy, Manipal won a gold medal in Public Speaking Competition. The girls’ team was trained at NCC Headquarters, Mangaluru, under Group Commander Col Anil Nautiyal and the Group Training Officer Lt Col Amit Ashri at Tumakuru. NCC Group Headquarters, Mangaluru, Training Officer Lt Col Amit Ashri said over 77 NCC cadets from all the three wings - Army, Navy and Air Force - will be trained at Alva’s College grounds in Moodbidri for the Republic Day parade in New Delhi. Out of 77 cadets, 42 are being trained in drill and 35 in cultural activities. Nine best cadets comprising three boys, three girls and three junior wing cadets will be selected by the Karnataka-Goa Directorate for the state-level competitions in New Delhi and this time, the NCC aims to send 22 cadets for Republic Day, Lt Col Amit said. In the previous year, 11 cadets from Mangaluru had taken part in the Republic Day parade.